It’s birthday week for the littlest Groves; in fact, today is Aiden’s first birthday. Here’s my firstborn with his firstborn and his wonderful wife. My husband has a mind like a steel trap when it comes to our sons’ boyhood. 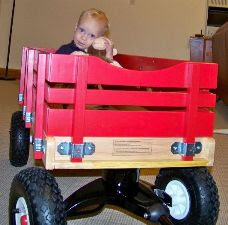 He reminded me about a month ago that the red wagon was a source of joy and fun and adventure for the boys for years. 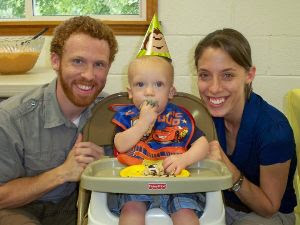 So, he had a mission—to get a wagon for Aiden on his first birthday. Since they live in a rural setting, he decided a regular Radio Flyer wouldn’t do. It had to be an All-Terrain wagon, not an item you find at the local WalMart or Toys R Us. And further complicating matters was the fact that we had to maneuver this long distance, figuring out from Florida how to get the wagon to rural Kentucky. That’s where the brothers came in. Hubby located a TSC (Tractor Supply Company) that carried the all-terrain Radio Flyer wagon and was located close to two of our boys. He paid for the wagon over the phone with a credit card and sent our youngest (the college sophomore) to pick it up. He took it to his brother’s apartment where it was assembled. Labor Day weekend brought an early birthday celebration for Aiden, and the wagon journeyed a few hours north to his house with one of our boys. As you can see, Aiden loved his birthday surprise! Maybe it wasn’t so simple after all … all that maneuvering to get the boy his first wagon. But it sure was worth it. And a pleasure? That’s what family is. What are grandmas and grandpas for? Love this. Without question, the love of family is one of life's greatest blessings and pleasures. adorable . Happy B-day to the little guy. How sweet that your husband had this great idea.